Abstract. In the Northern Hemisphere, seasonal changes in surface freeze–thaw (FT) cycles are an important component of surface energy, hydrological and eco-biogeochemical processes that must be accurately monitored. 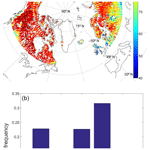 This paper presents the weekly polar-gridded Aquarius passive L-band surface freeze–thaw product (FT-AP) distributed on the Equal-Area Scalable Earth Grid version 2.0, above the parallel 50°N, with a spatial resolution of 36km × 36km. The FT-AP classification algorithm is based on a seasonal threshold approach using the normalized polarization ratio, references for frozen and thawed conditions and optimized thresholds. To evaluate the uncertainties of the product, we compared it with another satellite FT product also derived from passive microwave observations but at higher frequency: the resampled 37GHz FT Earth Science Data Record (FT-ESDR). The assessment was carried out during the overlapping period between 2011 and 2014. Results show that 77.1% of their common grid cells have an agreement better than 80%. Their differences vary with land cover type (tundra, forest and open land) and freezing and thawing periods. The best agreement is obtained during the thawing transition and over forest areas, with differences between product mean freeze or thaw onsets of under 0.4 weeks. Over tundra, FT-AP tends to detect freeze onset 2–5 weeks earlier than FT-ESDR, likely due to FT sensitivity to the different frequencies used. Analysis with mean surface air temperature time series from six in situ meteorological stations shows that the main discrepancies between FT-AP and FT-ESDR are related to false frozen retrievals in summer for some regions with FT-AP. The Aquarius product is distributed by the U.S. National Snow and Ice Data Center (NSIDC) at https://nsidc.org/data/aq3_ft/versions/5 with the DOI https://doi.org/10.5067/OV4R18NL3BQR. 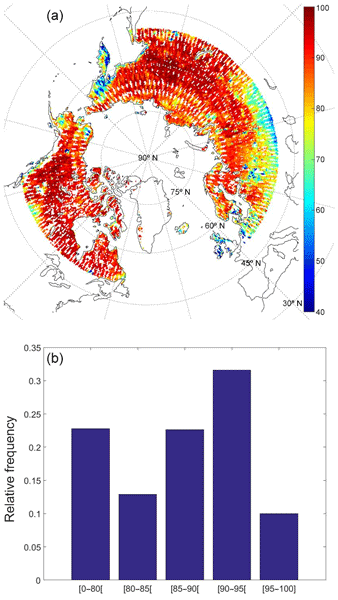 How to cite: Prince, M., Roy, A., Brucker, L., Royer, A., Kim, Y., and Zhao, T.: Northern Hemisphere surface freeze–thaw product from Aquarius L-band radiometers, Earth Syst. Sci. Data, 10, 2055-2067, https://doi.org/10.5194/essd-10-2055-2018, 2018.